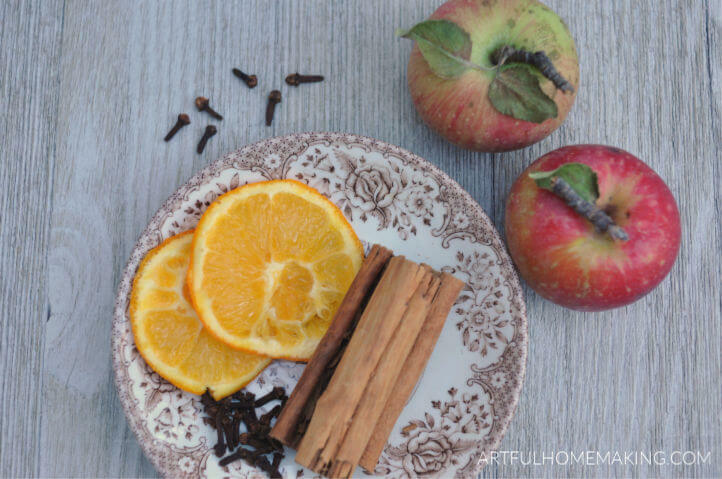 Make your home smell delicious with this fall simmering potpourri recipe! 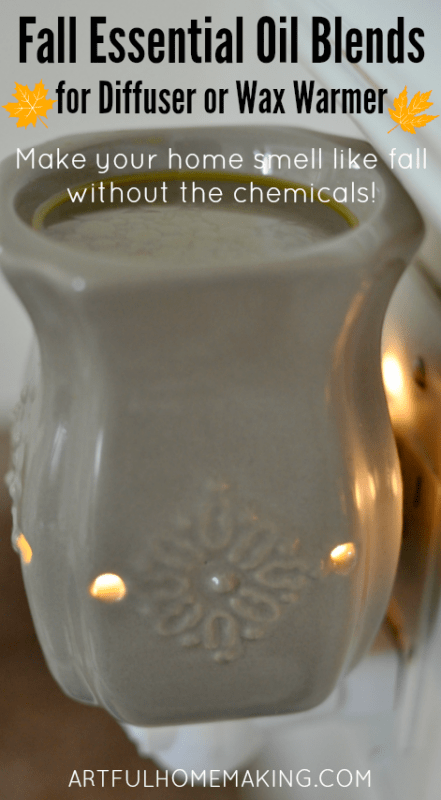 I love the scents of fall, and this is an easy and budget-friendly way to enjoy them without harmful chemicals! 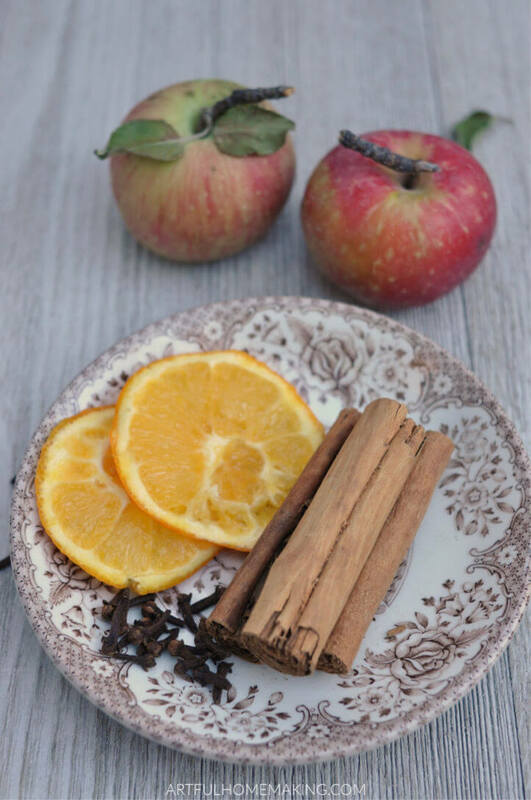 Did you know you can make your own “potpourri” simply by simmering a few simple ingredients together in a pot on the stove? This is something frugal homemakers like our grandmothers have been doing for years. I love that this fall simmer pot recipe is simple, inexpensive, and also chemical-free. It’s a win all around! You can use fresh ingredients, but this is also a great way to use up odd pieces of fruit and older spices. Last month we went to the apple orchard and picked apples. We came home with quite a few, and we’ve been enjoying apple desserts of all kinds (apple pie, apple crisp, applesauce, etc.). You can take peels and cores leftover from making those desserts, toss them in a pot with some cinnamon and cloves, and simmer! Fill a small saucepan about halfway with water and bring to a boil. 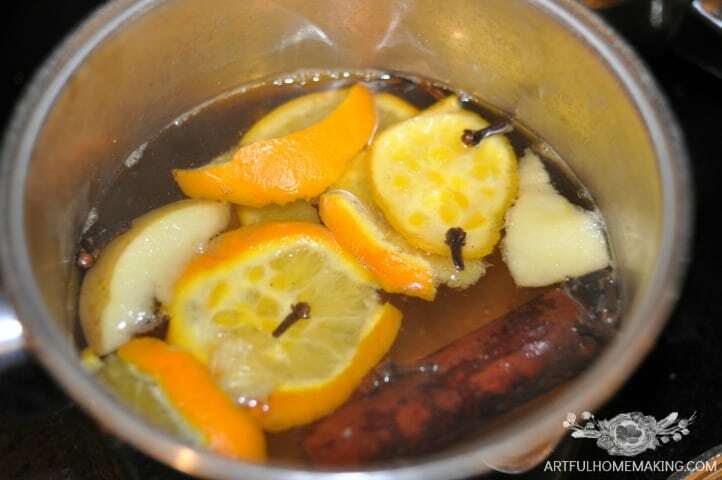 Turn the heat to simmer, and let your fall simmering potpourri recipe simmer all day, making your home smell amazing! You do need to remember to check your pot every once in awhile to make sure the water hasn’t boiled away. If the water level is getting too low, simply add more to the pot. 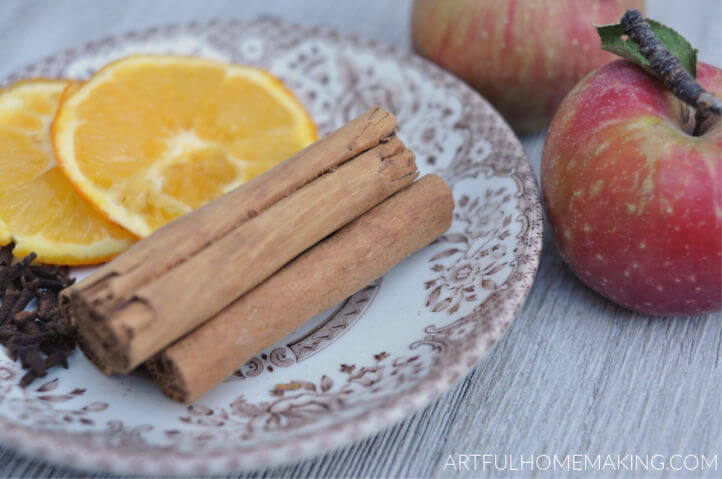 The delicious aroma of apples and cinnamon will fill your house, making everything feel cozy and homey. If you refrigerate your potpourri, you can keep reusing it for several days or possibly even up to a week. Just add water and possibly some fresh spices if necessary. We regularly find outdated spices and cinnamon sticks at our local discount grocery store for very cheap. Those inexpensive containers would be great for your fall simmering potpourri recipe! The great thing about this recipe is that it can be adapted in so many ways. You can add other ingredients (including essential oils—cinnamon essential oil would work really well) and change up the amounts, and your simmer pot will still smell delicious. I can’t wait for fall – I might need to start this now! Thanks for sharing on Homestead Blog Hop! I can’t believe fall is just around the corner! Oh I love this idea!! So simple yet a great way to make our home, well, homier! Thank you! So glad it was helpful, Amy! Thanks for this great idea! Can’t wait to try it. Oh, I love simmering potpourri! We had a cast iron furnace insert in our fireplace growing up and would heat a kettle filled with spices on top of it. The whole house smelled so good. Thanks for taking me down memory lane and thanks so much for sharing at the #happynowlinkup! How fun to have your simmering potpourri in your fireplace! Thanks for the recipe! I love doing this in the fall and now I have a new smell for my house! Saw your post at the handmade hangout party:) pinned! Beautiful post. I could practically smell it while reading. Do you ever use cheese cloth to hold it all together? Thank you, Kim! I don’t use cheesecloth for this, since it’s just a simmer pot. All of the ingredients just simmer in the water and then you can either throw them out or save the mixture and reuse it again. My next trip to the store I’m picking up some cinnamon sticks! Great idea! Thank you for sharing this at Party in Your PJ’s! I’m pinned to my Household Tips board.